This themed cape is made of washable crushed velvet lined with comfortable China silk. It is easy for children to put on and take off with quality Velcro closures. Launch date: February 15, 2009. Consensus® Movie Edition by MINDLOGIC INC. 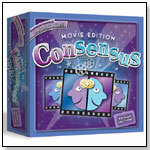 In this Movie Edition of Consensus®, launching in March 2009, the object of the game remains the same as in the original Consensus®, but the central theme of the game revolves around movies. Game play is driven by questions of opinion regarding movies. Now little boys and girls can be like their big brothers and sisters, with their very own Webkinz toy, Webkinz Jr. “Webkinz Jr. is a world for younger children to discover, where learning and daily activities can be chosen by parents to meet their child’s needs," explained Howard Ganz, president of Ganz. "The site is bright, welcoming and easy to explore, with music, familiar environments and lots to do with every visit.” The 12", super-soft Webkinz Jr. Monkey comes with its own code so kids can enter an online play world. Launch date: Spring 2009. This peel-and-paint art project contains safe, non-toxic and washable powder art in eight colors. Children simply peel away pieces of the design to expose a sticky surface and then apply the different colors of powder to the appropriate sections. Puffee Luvs by AURORA WORLD INC.
Puffee Luvs are nearly impossible to put down once you start holding and cuddling them. Puffee Luvs (6”, MSRP: $5.50) include a kitty, pig, cow, bear, bunny and elephant. Perfect for kids of all ages, each of the cuddly animals is bean-filled and machine washable and soft enough for nap time. Carry-All Caddy by THE PIGGY STORY INC.
Other products from THE PIGGY STORY INC. This 6" x 4" x 5.5" bag is available in various styles and features waterproof nylon so that it can be used indoors or out. It has pockets around the outside and can be filled with toys, supplies and accessories in the main compartment as well, helping to keep things organized. HEXBUG Crab by INNOVATION FIRST LABS, INC. Measuring just six centimeters long, each battery operated HEXBUG Crab is loaded with robotic intelligence. The six-legged creature feels its way around while sensing objects in its path and avoiding them. Users interact with the bug by tripping the sound sensor with a hand clap or loud noise, which sends it crawling off in a new direction. Launch date: September 29, 2008. Dare to Lead! is an interactive board game that develops leadership skills, critical thinking, and problem solving. Dare to Lead! is a flexible new learning tool for students and adults. It can be used for leadership classes, CAPP classes, Planning 10, retreats (school and corporate), and individual lesson topics. This game is designed for individuals and groups to work their way through questions that require problem solving ability, the power of persuasion, group dynamics and co-operation, taking a stand on issues or dilemmas, and creative thinking. 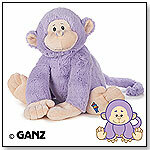 Snuggle Buddy is a plush toy and security blanket that offers play and soothing and tactile benefits. It is a wonderful gift that grows with baby and becomes a comforting companion for months, even years. Winner of the 2010 Top Choice of the Year Award and the 2010 Seal of Excellence Award from Creative Child Magazine. The Pilloroo is the pillow with the surprise pouch. Each pillow has a zippered pocket at the top that opens to a hidden pocket big enough for a small toy, book or remote control. The pillow is stuffed just enough so kids can’t feel the toy from the outside. There are eight themes for girls and eight themes for boys. Each Pilloroo comes with a toy that coordinates with the theme. "The Pilloroo is the best hiding spot for kids!" President Vicky McQuoid of Pilloroo Designs told TDmonthly. This product received a 2008 Mom's Best Award. Launch date: September 2008. Hairdresser Art Smock by KIDZSMOCKS INC.
Other products from KIDZSMOCKS INC. The Hairdresser art smock comes in a pink design with illustrations of a hairdresser's common items, such as a comb, brush, and scissors. It is 100% waterproof and can be fastened on from the back with Velcro. Produced in the same contemporary style as our best selling Boikido blocks, these 10 Rainbow Cubes are adorned with colorful numbers and letters as well as whimsical animals. Exposing your child to counting and the alphabet, these cubes can be stacked up high, used to build, or inserted one into another while developing spatial and motor skills, too. Tested to meet European and U.S. safety standards. Small 4 oz tub of glow-in-the-dark for fun in the dark. This natural version of the Classic Skwish toy is made from rubberwood and has a water-based, nontoxic finish. It measures 5.5" high. Launch date: January 2009. 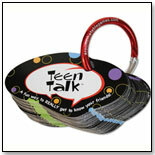 Created by teens, for teens, this set of 50 diverse questions is sure to spark some colorful conversations. The cool carabiner clip attaches to backpacks, sports bags and overnight bags. Launch date: February 15, 2009. Ze Super Heroes have super powers ... but they also have flaws that negate those powers. Zonk the Monkey, for instance, is a self-proclaimed "super climber," yet he's also afraid of heights. There are 6 Ze Superheroes so far. You can clean them by surface washing only. Launch date: 2009.